Over the past few months it has been revealed that Rogue One: A Star Wars Story will connect the saga more than we realized. Appearances by characters such as Bail Organa, Mon Mothma, Saw Gerrera and Darth Vader will further link the Prequel and Original Trilogies together, as well as Star Wars: The Clone Wars. We even learned earlier this week that Rogue One will include a connection to Star Wars Rebels. Furthermore, a new rumor from our friends at Furious Fanboys suggests even more cameos could be included in the film. Of course, the following information should be taken with a grain of salt, and if true, could be considered minor SPOILERS. Read on at your own risk. According to Furious Fanboys, the cameos will be included in a scene near the end of the first act that takes place inside the Rebel base on Yavin IV. 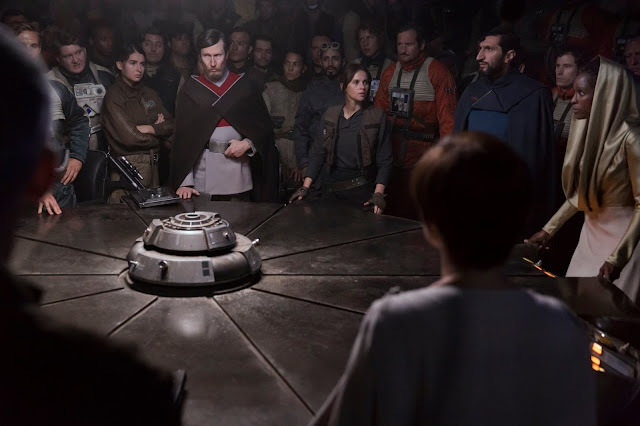 The scene(a portion of which you can watch above) features Jyn Erso giving a passionate speech to fellow rebels, including Bail Organa. Apparently two Gungans are included among the crowd, one of which bears strong resemblance to Jar Jar Binks. Additionally, Oliver Ford Davies, who portrayed Naboo governor Sio Bibble in the Prequel Trilogy, reportedly spent one day on set filming scenes alongside the Gungan stand-ins. Furious Fanboys cautions us that even if these reports are accurate, the cameos still may have been cut from the film. If included, the Gungans will most likely not have any lines. Personally, I feel this is very exciting and I also think it makes perfect sense that Bibble and Jar Jar would be at the Rebel base at this crucial time. Mr. Binks himself was the one who gave Palpatine emergency powers in the first place which allowed him to become Emperor. Perhaps the Gungan realized his mistakes and is trying to right his wrongs by supporting the Rebellion? I find this all very fascinating and, if true, I hope the filmmakers find a way to include these cameos. Im pretty skeptical about this rumour.. but i really hope it's true. I LOVE the idea of Jar Jar being a part of the Rebellion. Perhaps Jar Jar was is captive and they are about to execute him.